"The Great Highway" - Sneak Peek!! Create an unforgettable ambiance when hosting a formal sit-down dinner or a cocktail party at your next event. There are countless reasons to “party” at The Great Highway. Car Shows: The Great Highway is an incredible place for a car show as well as a final destination for those Sunday drives with your car club. We are conveniently located right off of Highway 101 and we can provide plenty of parking for all of your classics, hot rods, etc. What better way to wrap up your cruise in a relaxing setting of classic cars, good music and good times! 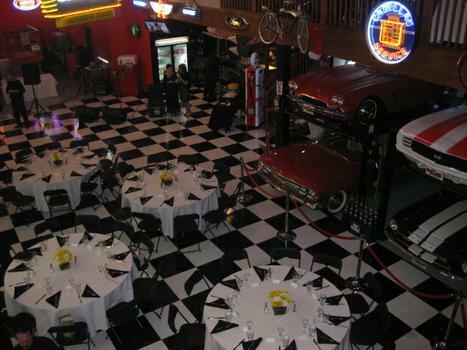 Included Event Items: Your rental fee includes our Event Specialist and her assistance throughout your party planning and at your event from start to finish, professional cleaning, disposal of all garbage, two (2) security guards, arrangement of all cars to suit your party needs and rental of tables, chairs and linens if needed. Optional Event Items: • You are welcome to select a caterer of your choice whom we will be more than happy to work with or we can personally recommend a few to you. • We have our own bartenders readily available at an additional cost. • Personal, professional casino gaming dealers are also available at an additional cost. •	We are happy to provide you with a photographer at an additional cost. •	You are welcome to bring in your own DJ or band. Cancellations: Cancellations must be received in writing within forty-five (45) days prior to your event. Should you cancel within this 45 days period, your date and security deposit will be forfeited.